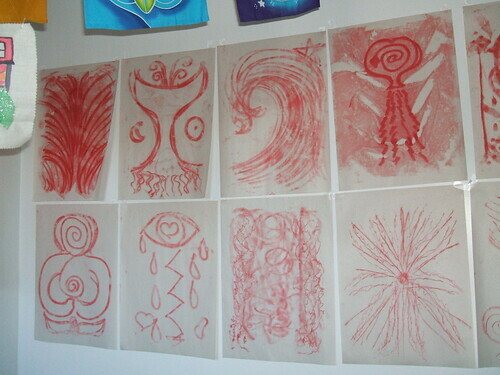 Seeking ways to access deep soul through creative art and helping others to do the same. A friend sent me the link to the web page. I am the Celebrant/priestess in a pantheist, earth-based spiritual group in Washington, DC. Also, some of the furniture in the Farmhouse was cool, so I took pics for a friend who makes furniture. Last Friday at 11:37am (EST) was the Full Moon in Gemini. On Thursday evening, I gathered my materials for a Touch Drawing session to commune with my Younger Self and connect with the lunar energies in Gemini. To help my Talking Self, I gathered some information from a few web sites and set an intent for the working. Great - I will see if I can make the invitation to list events in the community clear. There are other people's listings up right now, scattered amongst my schedule... I ma just beginning a 2-credit class that runs 2 weekends a month apart, and inbetween we are going to be posting in the private group - this is the first time sop we will see how it goes, but i think will add much continuity to the class, and more interaction between participants. i just took a peek at your website. Very beautiful and inspiring work!! What a wonderful resource this community is! Thank you all, especially Deborah! Angela, Would you be up for sending reminders to this group for the full and new moons a day or two before, the the actual time of the event? At least full, though I am interested in attuning to the new moons, as well. I think it would bring us into more active participation.....Let me know if this works for you or not - don't feel you have to - its just an idea to generate more connection.